348 pages | 50 B/W Illus. "Designing the Olympics provides a groundbreaking look at the design milieu of the Olympic infrastructure. It successfully situates Olympic sociology within the range of creative practices that surround Olympic programming, which make manifest national priorities and narratives. It is an essential text for anyone who seeks to understand what the Olympic Games means to its host nations and to their global audiences." "Designing the Olympics constitutes a watershed in Olympic sociology. It brings a critical design perspective to analyze how the Olympic Games constitutes national identity through architecture and design concepts. It will shape our understanding of 20th Century Games editions and should inform any course that hopes to make sense of the Olympics in the 21th century, where image and design are at the heart of the Games experience." "This is an outstanding study of Olympics design that challenges the limits of representational theory. 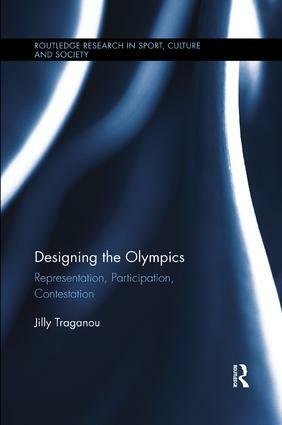 Drawing on a number of iconic case studies of Olympic design, Jilly Traganou’s book skillfully overcomes the perennial simplistic interpretation of the symbolic power of Olympic Games and rather highlights the practicalities in design making; the design milieus and platforms; the daily processes of participation and contestation. Beautifully written and well-researched, this book takes us into the heart of different Olympics games from the 1960s to our days by tracing their specific actor-worlds and following a multiplicity of actors’ voices. It provides a fascinating account of the pragmatist effects of Olympic design on our cities and nations. By addressing current scholarship not only in Design Studies, but also in Sport Studies, Anthropology, Material Culture, and Political Sciences, the book will appeal to an audience of both scholars and professionals within and beyond the field of design and architecture. To architecture, urban planning and urban design professionals with an interest in the social and political dimensions of their work, the book offers a wide range of precedents, fresh methodological insights and critical perspectives on the making of the Olympic Social. The book will also appeal to academic faculty members looking for ways to teach design and architecture beyond authorship and formalism, and political theory beyond policy and intentions, seeking instead to develop a more comprehensive perspective of design and the built environment in their complexity of material and political meanings." "This is a must-read book for anyone interested in exploring narratives about the Olympic event. A lot has been written about the Olympics in relation to its past history and future challenges. But this book provides innovative perspectives in unpacking different dimensions of the Olympics through the element of design. While offering a rich text for the scholars from the field of Design Studies, the non-conventional understanding(s) of design as enunciating both material and non-material discourses has a lot to offer to scholars from a variety of disciplines such as the Olympic Studies, Sociology, History, Anthropology and more. The honest and reflexive writing style of the author captivates any reader to follow her Olympic journeys." Jilly Traganou is Associate Professor in Spatial Design Studies at Parsons School of Design, The New School, USA. She is the winner of the 2016 Design Incubation Award for Scholarship.